IPv6 (Internet Protocol version 6) is the future of Internet telephony. And this book is your guide to that future. IPv6 is the replacement for the currently used IPv4 (Internet Protocol version 4). IPv6 will offer increased IP addresses (full 128-bit addresses, compared to the 32-bit addresses of IPv4), enhanced security, and greater robustness. It will also be fully “backwards compatible” with existing IPv4 systems. These capabilities will finally make Internet telephony a viable competitor to conventional switched telephone networks. In this book, Dan Minoli clearly explains IPv6 and how telephone networks can be built on its foundations. 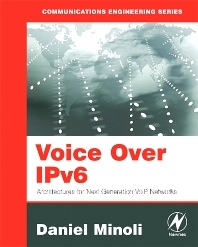 This is not just another IPv6 book; instead, it focuses on those aspects of IPv6 relevant to Internet telephony systems and voice networks. Minoli uses a compare/contrast approach, exploring where IPv6 is similar to IPv4 and where it differs, to let you quickly grasp the essence of IPv6 and the similarities (and differences) between current IPv4-based systems and IPv6-based systems. If you will be designing, implementing, or maintaining the next generation of Internet telephony systems, then you need the information in this book! Networking and telephony engineers and engineering managers; Students in graduate engineering programs.